Venice Hotel Palazzo Priuli? No Hotel suprises you as much as Priuli! Surprisingly, this Venice Hotel Palazzo Priuli is one of my favorite hotels. 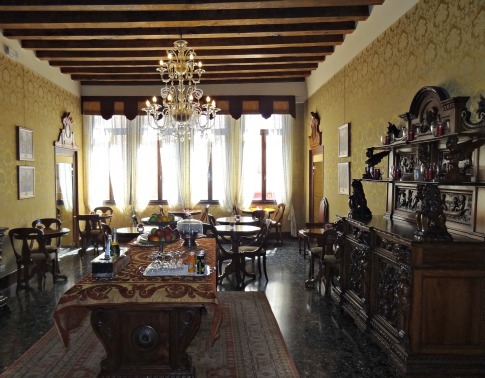 the 14th century character make it a perfect Venice Hotel. Last year I booked in advance. Due the circumstances I had to change the dates. No problem. I stayed 2 nights in their best room. The room was so spacious with an oversized king bed, a suite. With my family (2 kids) we had a wonderful time. I’m sure you will have a great time too. 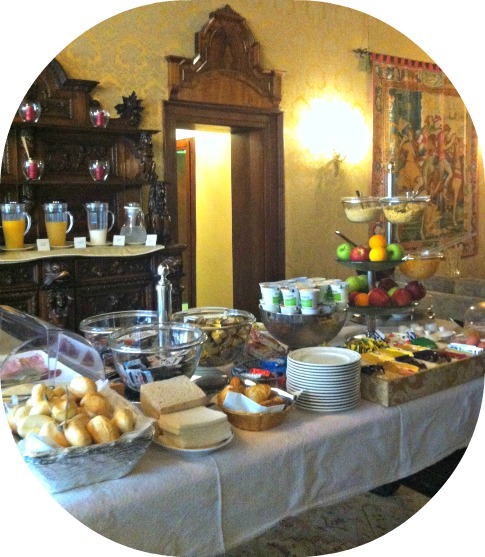 Price: from EUR 185 – 400 per night per room, depending on the season. Venice Hotel Palazzo Priuli has 10 rooms. Luggage will be carried upstairs by the friendly staff. And like I told you before the locations is great. 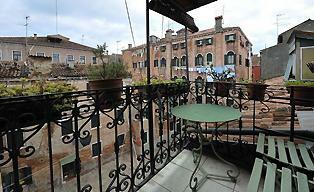 It’s near Piazza San Marco within walking distance of all attractions. Nevertheless, how to get there is quite a journey (see below). All interior is authentic since it is a former palace of a Doge. Venice Hotel Palazzo Priuli even has its own mystery. When you go to the 1st floor, the stair you have to walk is tilted at a near 20 degrees. Also some parts of the floor are not straight. It looks awkward against the vertical walls. I stayed with my family in room number 101. It was right next to the breakfast area, but no noise. It was a lovely room with a wardrobe and a spacious bathroom. One smaller bed and king sized bed. Like we were living 700 years ago, as we were queens and kings. The beamed ceiling made it a real great experience. The terrific breakfast was served right out our door. Fresh fruit, bread, meat, cheese, cereal and eggs with a lot of other delicious food. We were one of the first guests to eat breakfast, the lady who served was very friendly and helpful. A minus point is how to get there. Especially, when Venice is your first time. A good map will do. It's a short walk from the nearby (vaporetto) boat station ‘San Zaccaria’. This is your stop when you take line 1 (in high season). When taking line 2 (low season) you have to get off at station ‘San Marco’. Take the corridor that leads to Campo San Zaccaria, straight across the station ‘San Zaccaria’. Turn at the end of the square left and then turn right onto Campo San Provolo. Passing the loveliest and good restaurant S. Provolo (Pizza & Fish specials) turn left on this square. Walk straight to the canal. Venice Hotel Palazzo Priuili is in sight. 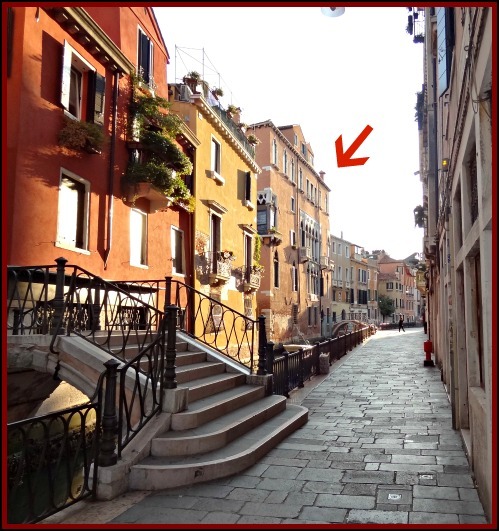 Walk to the right and then cross the ‘Ponte Del Diavolo’ bridge. The bridge ends right at the doorway of the hotel. You will walk through small alleys and during summer it might be busy with day travelers. Don't be afraid. You will not get lost. Certainly, it is better to buy in advance a map of Venice. Or use your Google GPS;). Next time when I’ m in Venice, I will stay in the Palazzo Priuli again. And you? 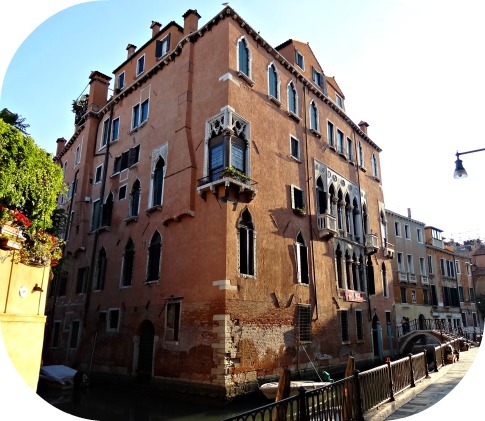 Or do you want to make your own story about this Venice hotel? Please make a review. Palazzo Priuli is also known as Hotel Palazzo Priuli. You've read about this hotel in Venice Italy. There is plenty to explore as you see. Discover Venice on my site and get more information about this Italian city.